Annual wildflowers are among the most popular California native plants. An important part of our natural heritage, they add unique colors and interest to the spring/summer garden. 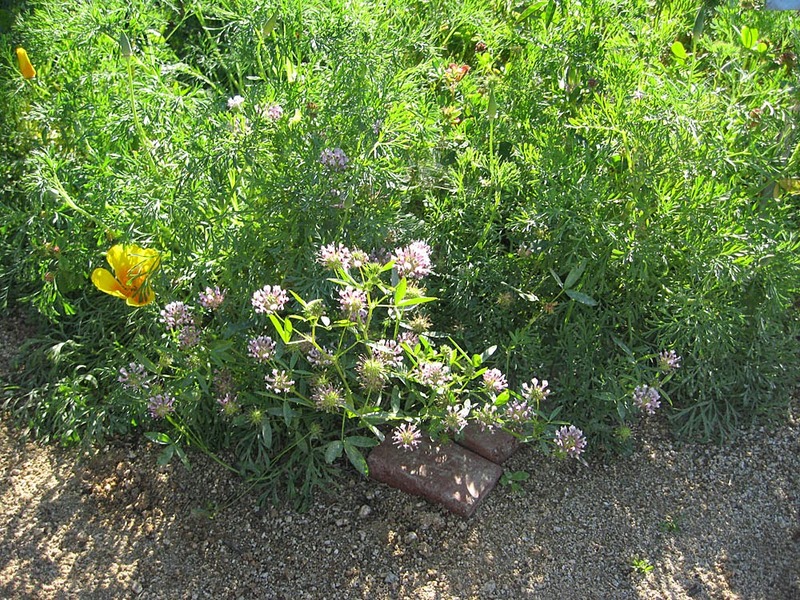 We covered the basics of annual wildflower gardening in a previous posting: http://mother-natures-backyard.blogspot.com/2013/01/growing-california-wildflowers.html Here we consider the sustainability side of growing annual wildflowers. You may be puzzled about the idea of ‘managing’ wildflowers. They are, after all, ‘wildflowers’; can’t they can simply manage themselves? And indeed they can – in the wild. 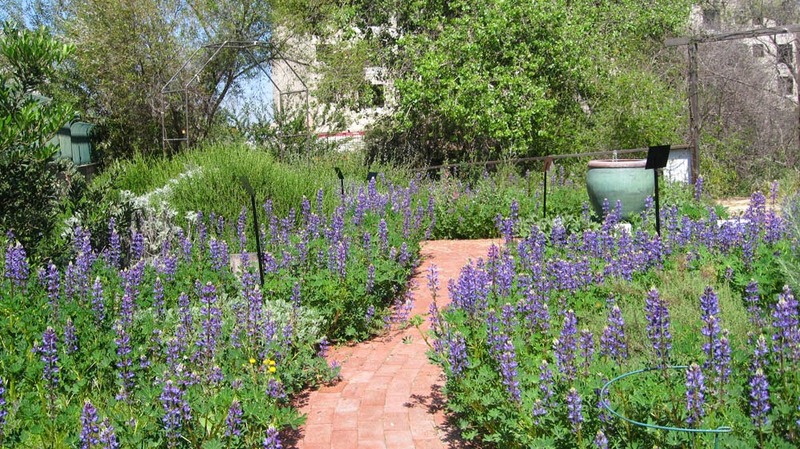 But local gardens differ in important ways from wild lands. In the case of annual wildflowers, several gardening choices play a key role in wildflower sustainability. Late spring visitors are often surprised to see golden wildflower stalks among the blooming shrubs in Mother Nature’s Backyard. One rarely sees drying flower stalks in public gardens; they are often removed as quickly as possible, to preserve the beauty of the garden. 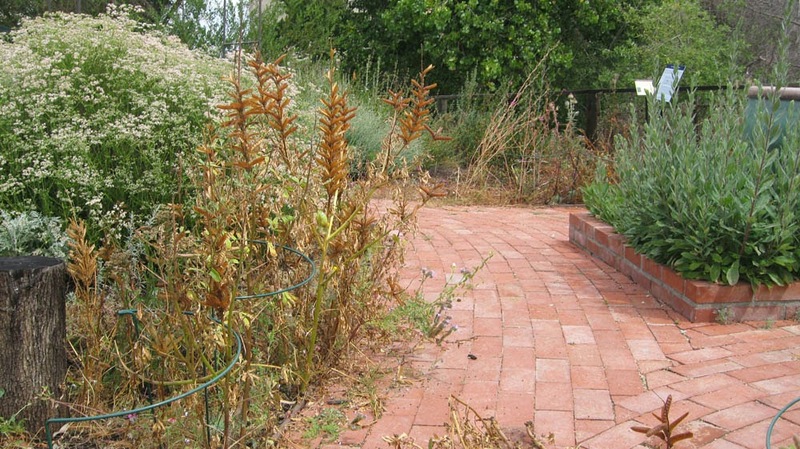 The practice of ‘immediate removal’ of spent flowers does improve the appearance of a garden – but at a cost. Understanding both the costs and benefits can help you make the right decisions for your own garden. Our annual wildflowers are remarkably efficient organisms. They germinate, flower and set seeds in only a few months, allowing them to succeed in our mediterranean climate. Local annuals survive the long dry season as seeds; so their continued survival is entirely dependent on the formation of healthy, viable seeds. Without seeds, the wildflowers will disappear from the garden. The last stage of seed development is the ‘desiccation’ stage, during which seeds lose up to 95% of their water. This extreme drying allows the embryo to enter a state of suspended animation; there it remains, unharmed by hot, dry weather, through the summer and fall. When the winter rains begin, the seed and embryo quickly re-hydrate, allowing the embryo to begin growing and thence to germinate. It’s often impossible to tell whether seeds have matured to the desiccation state before they enter it. If collected too early, seeds may not yet be ready; even if allowed to dry, they may not be viable. The safest strategy is to allow seeds to dry naturally on the plants. They can then be collected (important for seeds that are heavily eaten by birds) or allowed to naturalize in the garden. And that’s why visitors to our garden see drying flower stalks this time of year. They are very noticeable (see above). But what’s nearly invisible is the process of seed desiccation - taking place in every pod, capsule and flower head. A true miracle of life, though sometimes not a tidy one! In Mother Nature’s Backyard we emphasize life-friendly gardening. We do several things to support the continued survival of annual wildflowers in the garden. We allow seeds to desiccate on the plants. We collect some seeds for storage, sharing or propagation. We collect more of the seeds that can be over-eaten by birds (Elegant clarkia [Clarkia unguiculata], Tidytips [Layia platyglossa] and the Goldfields [Lasthena species] come to mind). The remaining seeds are allowed to self-sow (naturalize) in bare areas of the garden. 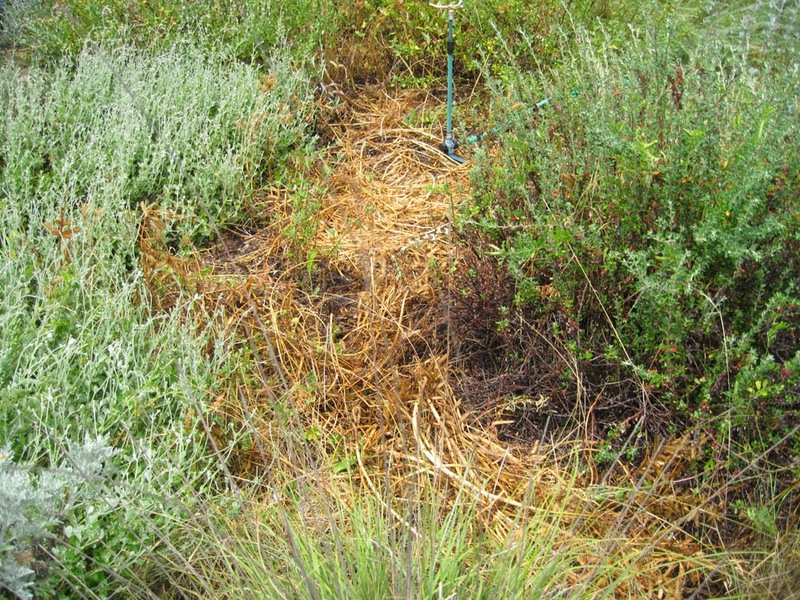 When dead plants are finally removed, they are used as mulch, further spreading the remaining seeds and providing summer mulch. Because ours is a public garden, we try to make our mulch as inconspicuous as possible. Some areas of the garden are left covered with only a thin organic or inorganic (gravel) mulch. The mulch helps protect seeds from over-predation by birds. And the thin mulch allows them to successfully germinate. These time-honored practices have been followed by Native Californians and sustainable gardeners for thousands of years. They mimic the ways of Mother Nature, providing food for animals and humans, while helping sustain the plant species. They are life-friendly and sustainable. So when our tidy-up instincts tempt us to remove plants, we remind ourselves of the benefits of waiting, just a bit, for seeds to complete their cycles. We look forward to next year’s wildflowers with hope and expectation. We hope you’ll consider doing the same in at least a few areas of your own garden. Tomcat clover is one of over fifty species and sub-species/varieties of clover native to California. Most grow in regions far moister than western Los Angeles County; but at least 10 species are native to the area, including those from the Southern Channel Islands (San Clemente and Santa Catalina Islands). 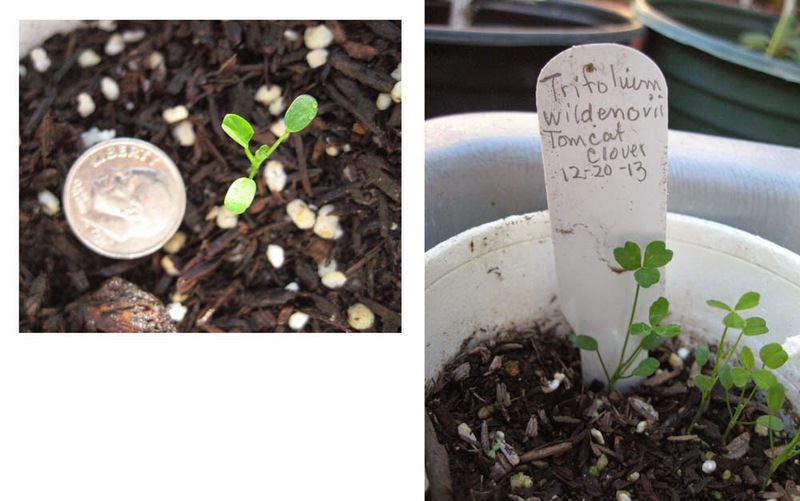 Tomcat clover (Trifolium willdenowii) is widely distributed from British Columbia, Canada, to South America. It can be found throughout much of the California Floristic Province (west of the Sierra Nevada Range). Locally it still grows in the foothills of the Santa Monica and San Gabriel mountains; early records also place it in coastal Los Angeles County, in areas that are now entirely developed. Clovers are members of the legume/pea family (the Fabaceae or Leguminosae). In addition to containing important food plants, the legume family is known for its relationship with nitrogen-fixing bacteria. Certain soil bacteria (the nitrogen-fixers) form nodules within the roots of many legumes. The modified bacteria obtain their food from the plants; this ‘food’ provides the energy needed to convert gaseous nitrogen to nitrogen forms that can be used by plants. Farmers often use clovers as a fallow crop. By planting clovers on ‘resting’ fields, then allowing the roots to break down in the soil, farmers improve the soil’s nitrogen supplies. This easy, natural method of fertilizing soils has been practiced for a long time. 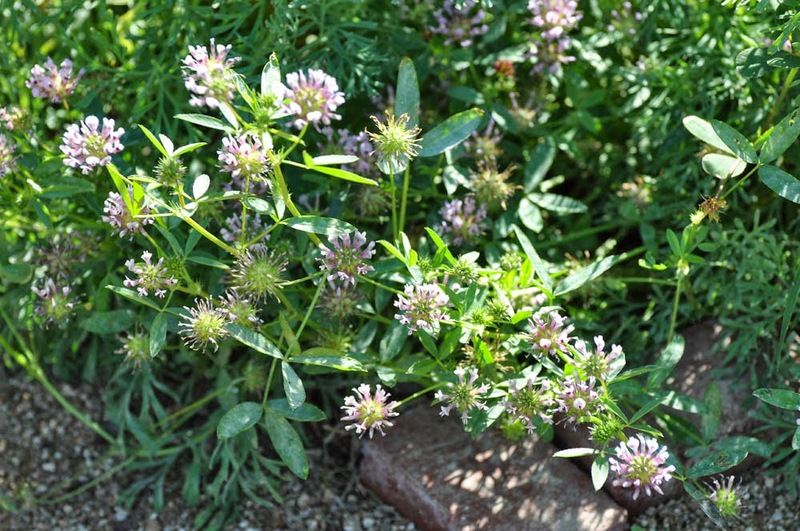 Native clovers can be used in a similar way in vegetable gardens. Tomcat clover is a small annual or short-lived perennial in our area. 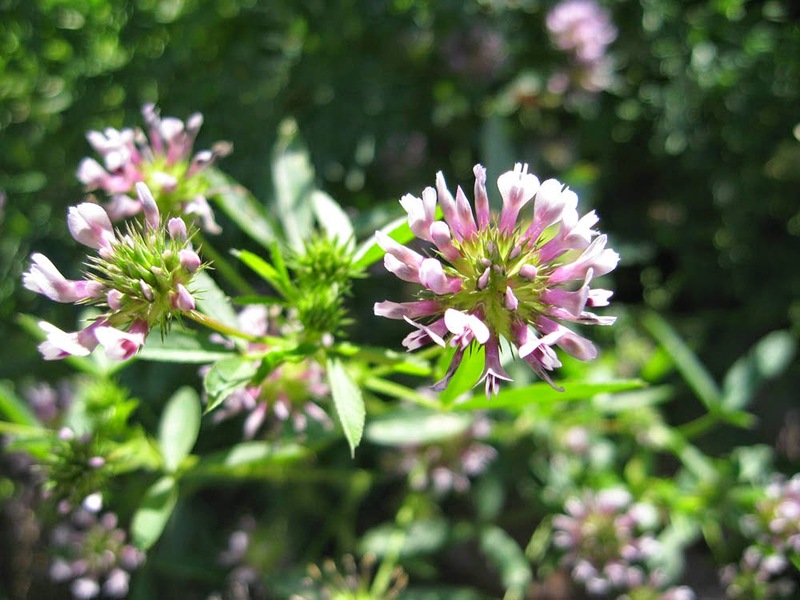 Growing 1-2 feet tall and about as wide, the plant has the delicate herbaceous stems we associate with clovers. The leaves, while composed of three leaflets (as expected for a clover) look less like the common ‘shamrock’ than one might expect. As seen above, the leaflets are narrow – sometimes almost linear – giving the plants a delicate, open appearance. 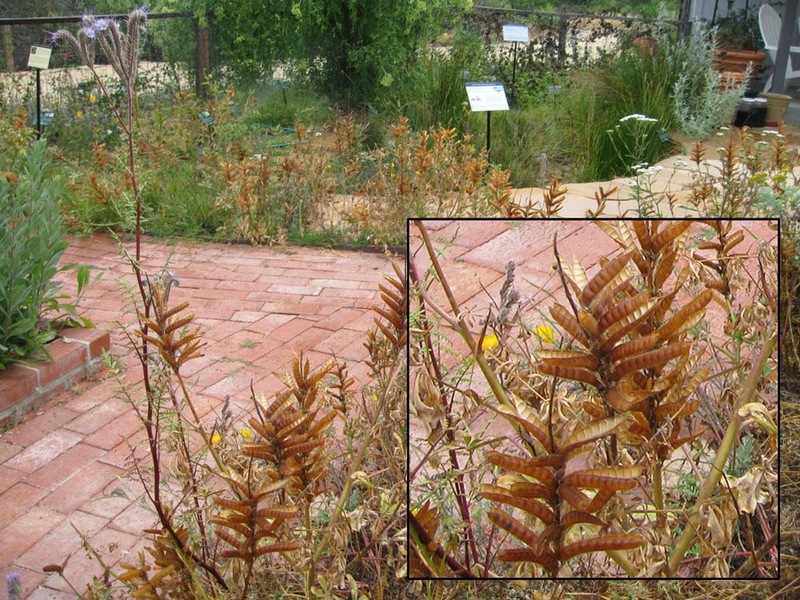 Plants have a deep taproot, making them more drought tolerant than some wildflowers. In winter-warm areas they may spread via their roots, sometimes forming large colonies in the wild. Tomcat clover blooms in spring, anytime from March to May in western Los Angeles County. 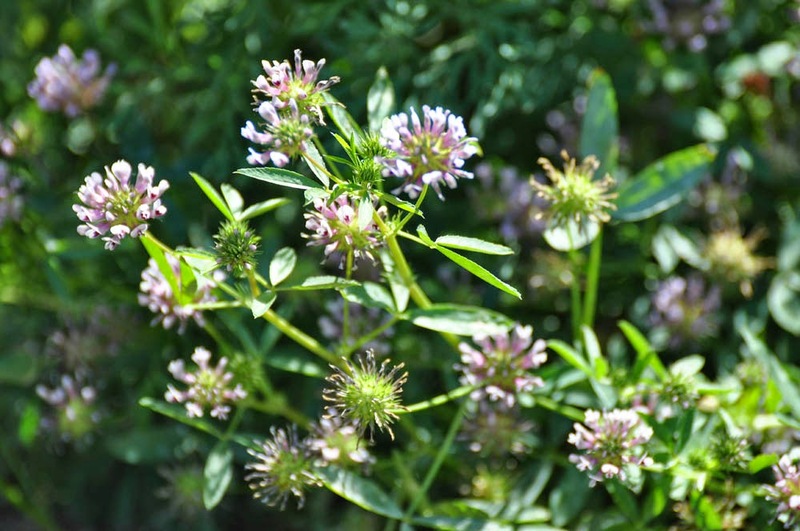 The tiny flowers grow in ball-shaped clusters typical of clovers. The flowers range in color from pink to purple; the colors are more intense in sunnier locations. From a distance the flowers are delicate, old-fashioned and decidedly pink-purple. But if you haven’t looked closely at a clover flower you might want to do so – they’re more interesting than you might imagine! As seen above, the petals are fused into a tube that’s lavender or purple and may have darker veins. The lobes (wings) of the tube resemble the ‘banner’ and ‘keel’ of other peas (for example, Sweet peas or Lupines) though less clearly defined. The upper (‘banner’) lobes are shades of purple/violet while the lower (‘keel’ lobes) are usually white tipped with a blotch of darker purple/magenta. All but one of the yellow-colored stamens (pollen producing organs) are fused. In sum, the flowers are very decorative and attractive. Tomcat clover is not too particular in its growth requirements. 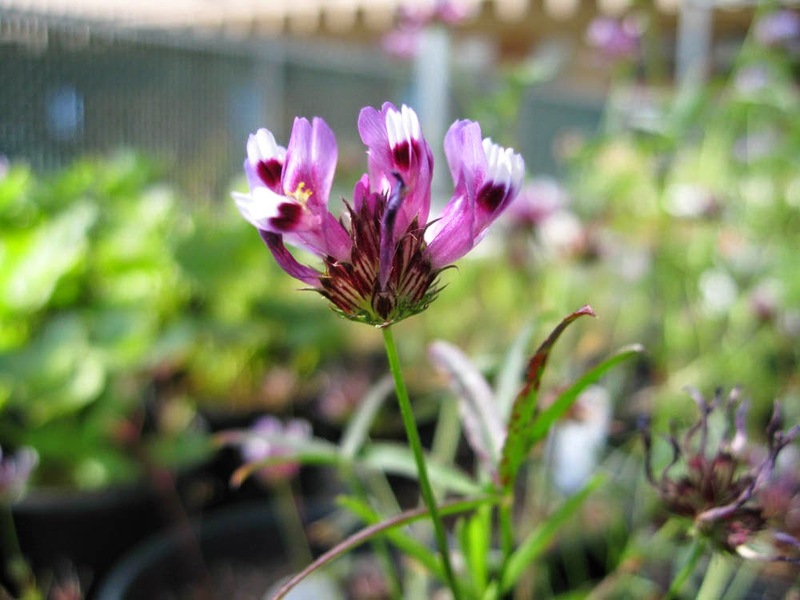 It likes a well-drained soil, but does fine in many clay soils; it’s also slightly tolerant of salty soils. While it grows in both full sun and part-shade, we’ve found it does best in areas with some afternoon shade in our area (during its winter/spring growth period). Like all annual wildflowers, it needs moist soils until it flowers. Tomcat clover is a typical annual wildflower. It germinates or starts to grow in wet winter/spring soils. The photo above shows that seedlings look much more ‘clover-like’ than do the mature plants. In fact, most clovers look quite similar as young seedlings; so you have to wait for the distinctive mature leaves to develop before deciding whether it’s a desired native clover or invasive alien. Trifolium willdenowii flowers in warm spring weather, then sets seed and dies back with the heat and drought of late spring. Begin to withhold water as plants start to flower, then taper off to none as the seeds develop. You can collect and store the dry seed – or let the plants drop their seed and naturalize. There are many good reasons to include Tomcat clover in the garden. As noted above, all clovers improve soil nitrogen (leave the roots in the soil when you cut off the dead stems). They also attract native insect pollinators and seed-eating birds. But the California clovers have even more to offer. Native Californian recipes utilize young plants for raw or cooked greens. In the past, plants/leaves were also dried for later use in soups, stews, baked goods and other dishes. The seeds are also delicious – raw or parched. They can be ground and used as a thickening agent in soups, stews and sauces; they can also be used in baked goods. 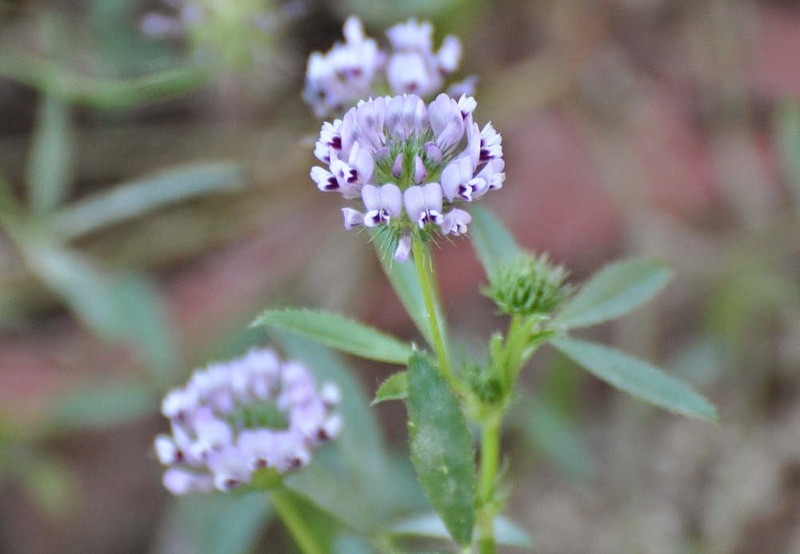 The flowers of native clovers can be used for making tea or in baking. The tea was used to treat gastrointestinal disorders and joint aches; steam from boiling flowers was formerly inhaled to clear head colds. In summary, Trifolium willdenowii is both a charming and useful plant for the home garden. It can be tucked into small areas, or grown between shrubs. It makes a good cover crop in the vegetable garden or orchard. It even makes an enchanting little container plant. 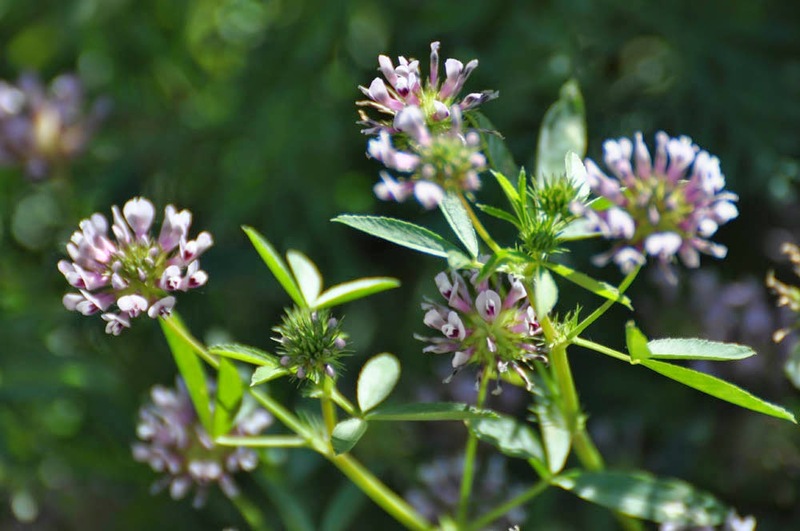 We hope you’ll want to add some native clover to your garden.